Panel Built’s Modular Wall System was designed with one overarching characteristic in mind, flexibility. The walls system itself is composed of 4 ft wide wall panels that connect to one another via our binder post system. This system allows for your modular office to be configured in any layout that you desire. In addition to having whatever layout you desire, this wall system allows for the panels to be reconfigured at a later date. As our customers’ grow, we often get requests to expand a previous job we’ve done for them. In this scenario, we will provide the customer with the supplies needed to meet their new layout then they can uninstall certain wall section and reinsert them into a new place. The result is a brand new office space that better fits their space needs. Another great benefit of utilizing a modular wall system is repairing damage to the wall. First, Panel Built provides a helpful step-by-step video for minor repairs to your wall system. However, for bigger issues that can not be easily fixed, Panel Built’s modular wall system provides a different solution. Since the wall system is panelized, the damaged walls can be removed from the office and replaced with brand new panels. The new panel will go into the same wall system and there won’t be any signs of damage afterwards. The panels themselves are a composite, sandwich panel that can consist of a variety of different variations. 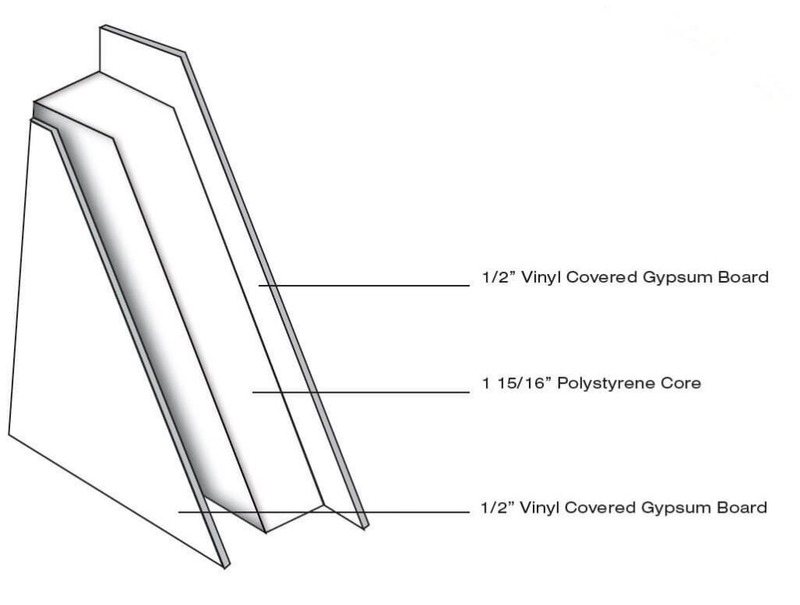 Our most popular panel type is a Gypsum/ Gypsum sandwich panel that has a polystyrene core. Overall, the panel consists of some of our most cost-effective materials which is why this product is referred to as our Value-Line Wall Panel. However, just because the Gypsum/Gypsum wall panel is affordable, doesn’t mean that it doesn’t do its job well. The panel has great sound deadening qualities and insulation properties. Additionally, the panel provides a Class A fire rating and an STC Rating of 30. Office Build-Out with Gypsum/Gypsum wall panels. This wall panel can be utilized in a variety of different environments, ranging from industrial to educational to even retail. That’s because the vinyl covering of the gypsum panel can fit into a variety of settings with its durable yet contemporary design. We provide our Gypsum wall panels in one of three standard colors: White, Dove Grey, and Champagne. The walls’ extrusions can either match the color of the wall (most popular option), or you can mix and match them (with the addition of our bronze extrusion color). 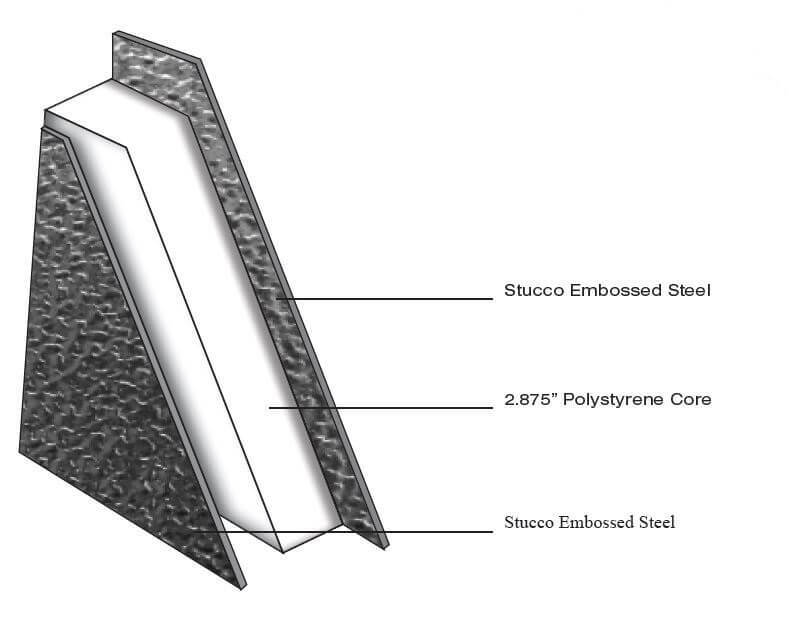 For a more durable option, Panel Built offers a steel skinned panel. This panel option comes with a22 gauge stucco embossed steel skin, a 2.875″ thick polystyrene core, and another 22 gauge steel skin. Our steel/steel panel option stands up well in harsher environments and will often be used for exterior applications. In fact, for our standard, quick-ship guard booths, the S/S panel is used. 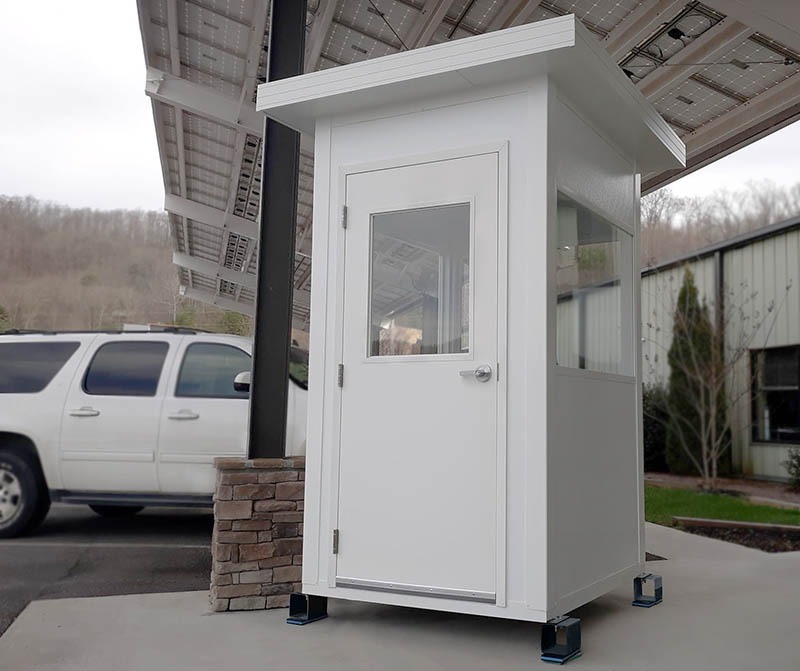 The panel gives the building great durability to stand-up to harsh weather conditions, and with help from our HVAC package, keeps the attendant inside in a comfortable environment. And the same flexibility that our G/G panels provide to our inplant offices, our S/S panels provide to our exterior buildings. Our exterior buildings are able to have a limitless number of layout combinations, including interior walls, bathrooms, etc. These exterior buildings are different from the interior due to their specially designed roof panel systems. The roof panels provide the building with additional weather resistance and help ensure the building has no water leaks. 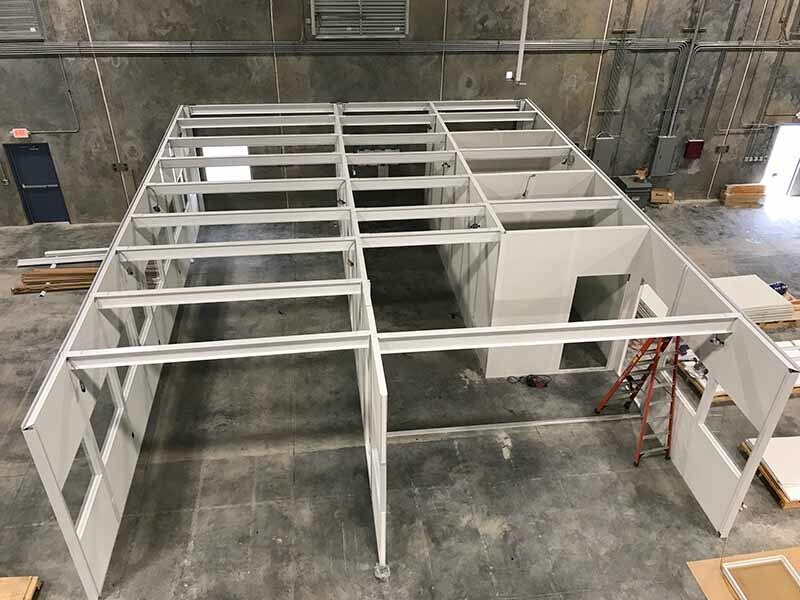 Panel Built even creates custom wall panels for unique applications like cleanrooms or even walls that need heavy loads attached to it. If you think that wall panels could help out in your next project, give Panel Built a call at 800.636.3873. We pride ourselves on being the Modular Construction experts and would be happy to help you on your project. If you have any questions, you can send them in to info@panelbuilt.com or you can ask us in our LiveChat, which you’ll see in the bottom-right of the page!